I'd like to introduce you to the newest member of our family. His name is Hudson Riverton and he's a 2-year-old shih tzu that we adopted from a rescue in New Jersey called Second Chance Pet Adoption League. You may have seen his cameo in my Angels on Horseback post a couple days ago, but I figured he deserved a proper introduction. Tomorrow marks the beginning of our 3rd week with this little guy and we couldn't be happier. He was already house-trained when we brought him home, so save for a couple isolated accidents, he's been pretty easy breezy to take care of. While he's happy and healthy right now, he has a sad story. Hudson was found wandering around Prospect Park in Paterson, NJ, where he'd been living for at least a few weeks. He was brought to an area shelter, but nobody claimed him so it seems he must have been abandoned. When they first found him, he was all overgrown and matted with fleas and worms and a host of other things. 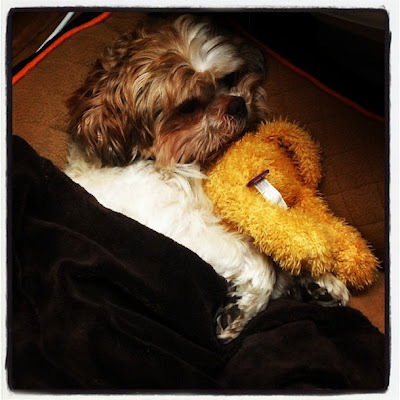 He also had a nasty case of kennel cough (aka a doggy cold). The rescue had to shave him down and give him medicine to nurse him back to health. They named him Furby and put him up for adoption. The minute I found him on the Petfinder.com, I knew he was meant to be our little guy so I filled out the application and sent it in. I was told that somebody else had an appointment to come get him, but that they would let me know if that fell through. A week later, I emailed again asking for an update and was happy to learn that the other couple had decided against him (they thought he was too active for their older dog). "He's ours!" I excitedly told Eugene, who told me to temper my enthusiasm just in case it didn't work out. "Nope, he's definitely ours," I said. I went ahead and ordered all the supplies we needed and proceeded to set up his new home. On the big day, we drove to NJ to meet him and it was love at first site. The adoption process was quick, and within 2 hours we were back in the car driving over the George Washington Bridge (and his namesake river!) with our new dog. When we brought him home, he was still getting over his cold, which meant that he was constantly coughing and sneezing. (I admit that it was kind of adorable, although I felt bad for him.) The rescue gave us antibiotics for him, and within a week he was good as new! It's been a lot of fun getting to know him. So far, we've learned that he's not really a morning dog. During the week, he waits patiently until Eugene is ready for work and calls him for his morning walk. During the the weekends, he likes sleep in as late as possible, and even then it takes some coaxing to get him to go out. He then proceeds to stretch and yawn for a few minutes before he lets us put his harness on. He is also NOT a fan of the rain. (I don't blame you, little fella! I don't like getting my hair wet, either.) 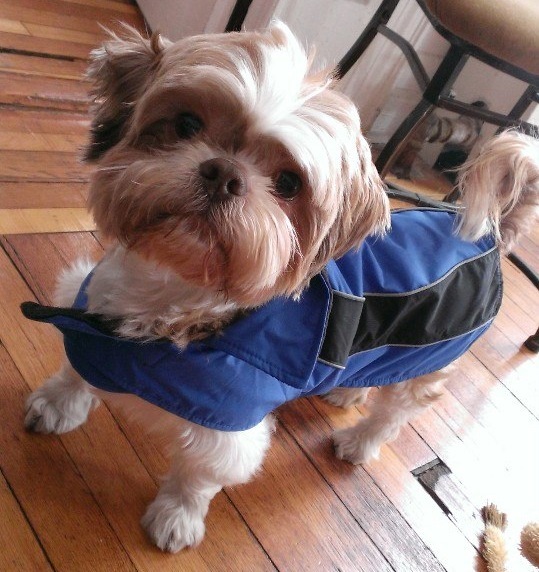 So we put this little jacket on him to keep him dry. He's definitely a little bit of a beggar (see above), so we're trying to train him out of that habit with a 100% no treats during mealtime rule. It's pretty tough when you hear him whimper and look at you with those big brown eyes, but we're sticking to it. As you know, I'm adamantly against processed food for humans, and feel the same way about doggies, so I'm transitioning him into a homemade food regimen, slowly phasing out the kibble in favor of a fresh concoction of grass-fed beef, veggies, herbs, yogurt, and supplements. I'm still working out the exact perfect formula for him, but will be sure to share more once I hit upon it. Hudson is a big fan of healthy snacks. He loves cucumbers, cheese, and baked sweet potatoes. His absolute FAVORITE thing ever is oranges. He goes absolutely crazy for them, hopping around and wagging his tail. The other day I was taking some cocktail photos for my next story in Cosmo for Latinas, and when I looked away for a second, he slipped into the set and stole the orange garnish from my glass like a tiny hairy little magician. He's also a pretty nosy little guy. 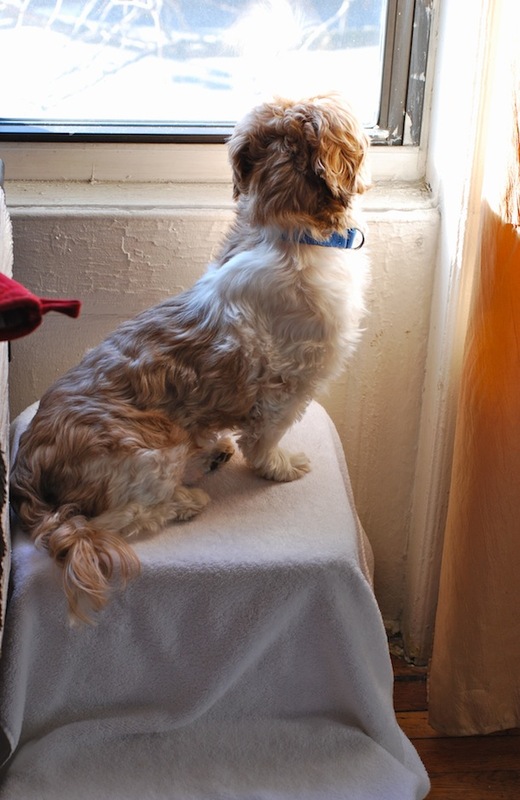 I noticed that he loves to look out the window, so I built him this little lookout perch. By "built" I mean that I stacked a couple heavy boxes and draped them with a towel. There were no actual tools involved. He now spends hours up there just watching people and cars drive by like he's Jimmy Stewart in Rear Window. It's cute to watch his little head move from side-to-side as he keeps an eye on things. At night, he sleeps in a little bed next to ours, snuggled up with a little blanket and his favorite toys. 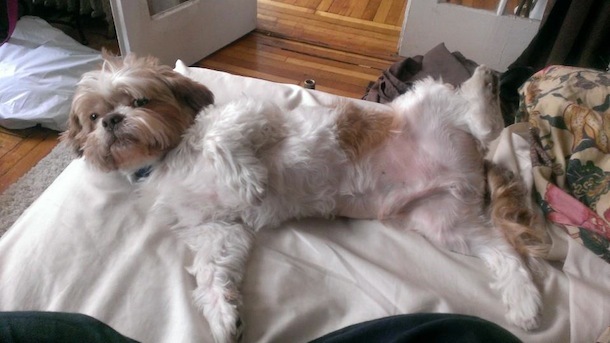 But occasionally he hops up onto our bed and stretches out provocatively hoping for a belly rub. We love our little Hudson, and we're looking forward to years and years of adventures with him. If you're looking to adopt a dog in the NY/NJ/PA area, I highly recommend Second Chance Pet Adoption League. They have so many wonderful dogs available and are really lovely and easy to work with. The adoption process was easy breezy and they were very honest and upfront with all information. 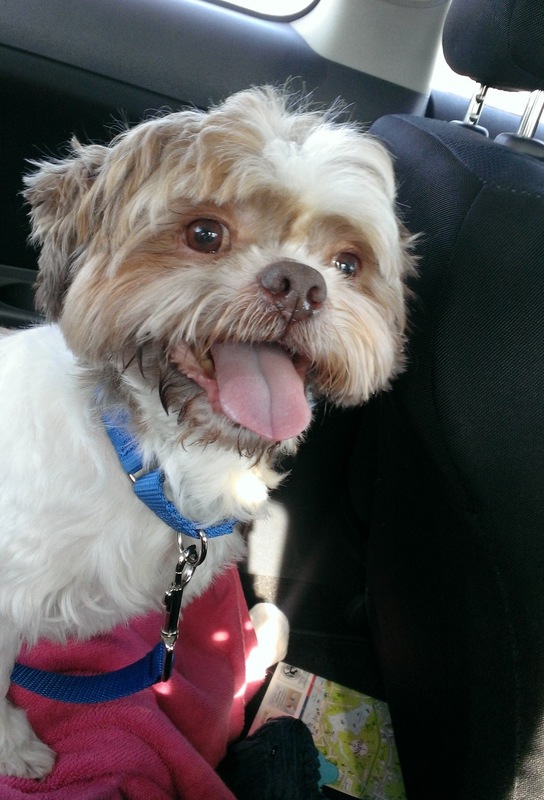 They sent Hudson home with us with a new leash and collar, as well as a coupon for a free first vet visit. You can visit their Facebook page here for more information.